Toyota Rush in 2019 starts at the price of Rs. 66.90 Lakhs in Nepal. United Traders Syndicate Private Limited, official distributor of Toyota cars and SUV in Nepal, is currently selling total of 4 variants. All of these vehicle are petrol engine and comes with displacement of 1496cc. Toyota is known for selling premium high end cars and vehicles. Seeing a strong demand in market for subcompact crossover SUV in Nepal, Toyota Nepal came up with Rush. This both fits the budget and likes of Nepali customers. 4 variants of Toyota Rush available in Nepal are Mid MT, Mid AT, High MT and High AT. Highest range of model comes with Automatic Transmission at the price of Rs. 75.50 Lakhs. Please note that above price of Toyota Rush is subjected to change and is for reference purpose only. Kindly contact Toyota Nepal to get the latest showroom price. 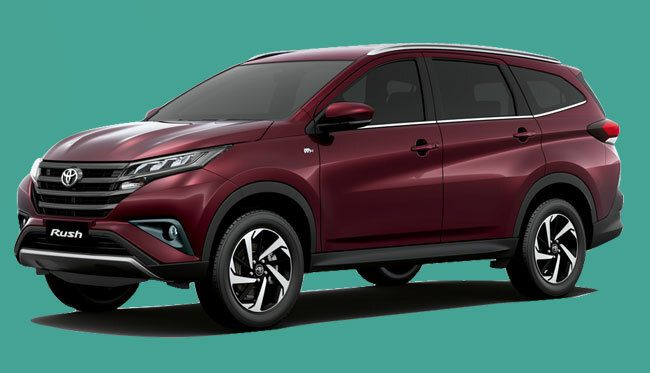 Note: Toyota Rush price list was last updated on February 10, 2019. Toyota Rush is a Japanese subcompact crossover SUV which carries the design concept of Daihatsu Terios. Daihatsu, one of the brand seen in the roads of Nepal, is a fully owned subsidiary of Toyota. In the segment, it is directly competing with likes of Renault Captur, Renault Duster, Tata Nexon, Ford Ecosport and Hyundai Creta. Rush comes with chrome slatted grille, aggressive air dam and dedicated slots for fog lamps. Vehicle has the ground clearance of 200mm. With fuel capacity of 45 liters and mileage of around 14 kmpl, it can be expected to give fair performance in long distance travel. You can message us your queries regarding Toyota Rush price in Nepal or its specifications, features at our Facebook page.